One of my dear friends, and long-term collaborative partners, Yvonne Perry has just released a brand new book entitled Shifting into Purer Consciousness ~ Integrating Spiritual Transformation with the Human Experience. Many of you may have heard Yvonne on the Spirit Authors podcasts, and also on my Garden of the Soul Radio Show (you can listen to her most recent interview by clicking HERE). Some of you might also know Yvonne as ‘Lavendar Rose’, the host of the ‘We Are One in Spirit’ podcast, where she has interviewed me several times. As I said, Yvonne and I work together a lot! Yvonne is a truly prolific author (I think she publishes a new book just about every year) on a range of deep subjects to do with human nature, healing, intuition and consciousness. She’s also the founder of a company called ‘Writers in the Sky’ that supports authors in many ways, including book promotion. In celebration of the launch of Yvonne’s new book, Shifting into Purer Consciousness, I thought it would be great to ask her some questions not only about the book itself, but also about the writing process when utilising things like intuition and channelling to develop a book. Finally, I thought it would be great to get her opinions on the role of authors in this era of shifting consciousness. This interview is part of Yvonne’s Virtual Blog Tour (more information on that at the end of the interview). 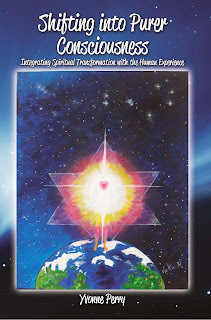 I do hope you enjoy the interview and that you check out her book this week at http://shiftingintopurerconsciousness.com. LYNN: The last time I interviewed you, you had just completed your book, Whose Stuff is This?, which talks about being aware of how different energies can impact people, especially if they are very sensitive or empathic. How is this new book the natural follow-up to your previous work? YVONNE: Whose Stuff Is This? ~ Finding Freedom from the Thoughts, Feelings, and Energy of Those Around You introduced the concept of oneness as the reason we are able to pick up energy from others. That book shared tips and exercises to help highly-sensitive people set boundaries, clear the auric field, and gain a measure of control over what they experience from outside sources. This new book takes this premise a step further by showing how what we think and how we feel inwardly directly affects what we experience outwardly. In other words, it’s all about learning to manage energy internally. Our ability to manage energy is a key component in maintaining peace during the current global shift that is causing misery to people who are resistant to of fearful of change. LYNN: Your book talks about the “ascension” process. What do you mean by that? Is it affecting everyone in the world or just specific people? YVONNE: The ascension process is a global awakening to spirit’s work within each of us personally as well as with humanity. It is also about the Earth entering alignment with the equator of the Milky Way Galaxy as it does every 12,000 or so years. The Earth is also completing one full astrological cycle known as the “precession of the equinoxes” as it does approximately every 26,000 years. During this cycle, the Earth passes through each of the twelve signs of the zodiac. This simultaneous completion of two cycles has a purging effect upon the Earth and humans. As we are moving into a higher dimension, Mother Earth is cleansing herself from the pollution of detrimental human influence; and humans are being urged through an inner stirring to let go of fears and the influence of the lower self that does not serve the purpose of love. LYNN: I work a lot with authors who “channel”. Why do you think there is such a surge in channelling writers right now? What’s really happening when a writer channels their work? YVONNE: Channeling is no mysterious process. Everyone can channel because all it requires is that we listen to our own inner guidance, which is coming from Spirit within us and from dimensions beyond this 3-D reality. Every inspiration, creative surge, and artist gift is a form of channeling. However, there are some people who are more attuned and able to receive guidance from ascended masters, angels, and universal beings of light. Those are the ones who have brought forth information to let us know what is going on and therefore remain calm as this planetary shift occurs. LYNN: How can writers, even those who are not “channellers”, utilise the “ascension” process to dive more deeply when they write? How can this enhance their awareness and creativity? YVONNE: In a sense we are all channelers because we have the ability to hear from our spiritual guidance team at any time. Due to the planetary alignment we are currently entering, many people are hearing more clearly, more often, and more accurately. To access this divine inspiration, we can set our intention with meditation or prayer before we begin a writing session and ask Spirit to move through our minds, emotions, and body as we create. Consulting with your inner guidance is a wise choice before making any decision or embarking upon any project. LYNN: What role do you think writers play in the evolution of spiritual awareness in our world today? How can writers best help heal and uplift the planet in these rapidly-changing times? YVONNE: Writers have a tremendous impact on any culture—especially in this age of spiritual awareness and planetary expansion. The manifestation process begins with a thought and is carried to fruition by emotions/feelings. Words originate as thoughts. When shared—written or spoken—words have the power to seed new ideas into the minds of others, penetrating old patterns and beliefs to create a paradigm shift. Just think of how one book, Dan Brown’s Da Vinci Code, stirred religious people to question the limited and tightly-sealed box of church doctrine they had accepted without considering whether or not it was their personal truth. The traditional method of major houses only publishing the written material of an elite few has taken a backseat to self-publishing within the last decade. Nowadays, people who have little notoriety can easily publish a book with a strong spiritual message and reach the masses to effect change. Many powerful teachings have been published by “nobodies” and this has had (and continues to have) a strong influence on our culture as readers share what they have learned. Many writers can address the same topic; but because we each have our own viewpoint and style of expressing our truth, the book and its message will appeal to different audiences, thereby creating an overall awakening of mass consciousness. If you are a writer and feel like Spirit has a message to share through you, start penning those words and seek publication. This interview with Yvonne Perry is part of her Shifting into Purer Consciousness Virtual Blog Tour. Yesterday, the tour stopped at Irene Conlan’s The Self Improvement blog. Tomorrow the tour will be at Shelagh Jones’ Spiritus blog. I do hope you’ll drop in on both of these sites to learn more about Yvonne, the book and the spiritual transition of our current era. You can read the full Virtual Blog Tour schedule at http://dld.bz/byrF7 . Lynn is also the Founder of the 7 Graces Global Conference, or 7GGC, an emerging movement of people who are actively creating and implementing a new paradigm for business, media and marketing that can help heal humanity and the planet by changing the status quo, and foster support and education for independent, ethical enterprise. Come BE the change at http://the7gracesofmarketing.com/7GGC (be sure to watch the video replays of our recent global conference).